A question that people regularly ask me is what kind of books, blogs and other resources I would recommend. To tackle this question once and for all I thought the best idea was to write one or more blog posts about it, starting with books that I would recommend reading. What books to recommend is an easy question in my opinion. There are really a ton of good books out there, and I don’t think it matters too much which ones you read. Start with some of the well known classics and it’s really hard to go wrong. After reading enough books on, for example, value investing you will see the content becoming more and more repetitious. They first book you read you might think, “Wow, that’s genius buying stocks at a discount to NCAV” while in the 10th book you start thinking “Can’t this author tell me anything new?”. It’s not that the 10th book is a worse one, but at some point you know the drill. So I have to admit that these days I rarely read investing books anymore, so quite possibly I’m not the most qualified person to give reading tips. But since you have been asking I’ll try anyway! All the books in the lists below are books I have read personally. If you think I’m missing something great, let me know in the comments. If you are totally new to investing these are the kinds of books that I think should be helpful to understand what (intelligent) investing is, what kind of attitude you should have with regards to your investments, and what kinds of stocks could be profitable investments. The Intelligent Investor I think this timeless classic is a must have on the reading list, and a good one as a first book to read. Margin of Safety Only buy it if you run a successful hedge fund and want to showoff with the books on your bookshelf. For the rest of us, you should be able to find the pdf-version somewhere online. The Manual of Ideas A way more modern text that incorporates many of the ideas of the previous books and some new ones. Common Stocks and Uncommon Profits and Other Writings There is more under the sun than just buying dirt cheap stocks. Essays of Warren Buffet At some point in your investing life you will probably get bored by hearing for the millionth time the same Buffett quotes, but if you are new to investing these are a must read. Instead of buying the book you can also go for the value option, and read all of Buffets shareholder letters on berkshirehathaway.com. Understanding psychology is extremely important if you want to make good decisions, yet at the same time it’s very hard to apply. There is a big difference between reading a book about psychology, and being able to avoid the many psychological pitfalls you read about. But reading these books is a good first step I think. Thinking Fast and Slow It’s not really an investment book, but a great book to understand the various heuristics and biases our brain has that can influence our decision making. An absolute must read in my opinion. Beyond Greed and Fear It’s the same topic, but this time a bit more tailored towards investing. 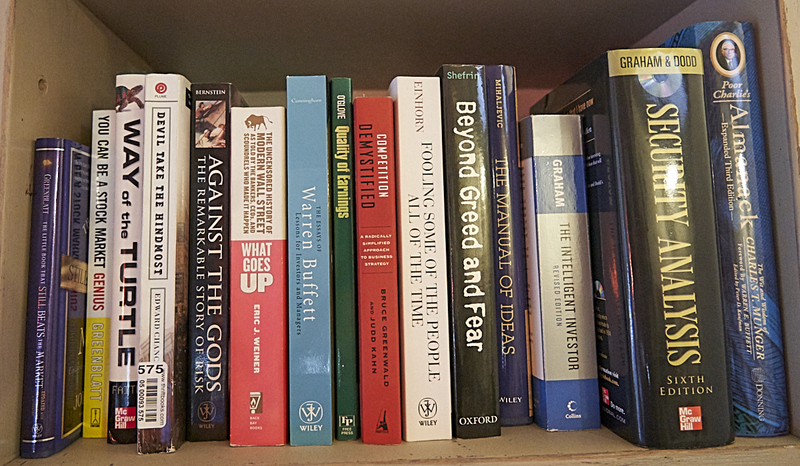 The border between books in this category and the investment basics category is arguably a bit vague, but these books are on average a bit more practical, maybe aiming at more specific subjects and heavy on examples and case studies. You Can Be a Stock Market Genius The title of the book is very cheesy, but this is really one of the best books ever written on special situations investing. Highly recommended! Security Analysis: Sixth Edition, Foreword by Warren Buffett Another classic that goes a bit more in-depth into the accounting and valuation. Don’t read this one as one of your first books though, probably a bit too tough and dry! Quality of Earnings Another text I highly recommend. Being able to spot weird things in financial statements is an invaluable skill. Financial Shenanigans A good addition to the book linked above. Most investing books I read nowadays fall in this category. Individually you’re probably not going to learn a whole lot from each book, but most of these books contain interesting nuggets of wisdom, and perhaps more importantly, are just very good reads. Fooling Some of the People All of the Time Entertaining story of Einhorn’s fight against Allied Capital. The Big Short One of the best stories about the 2008 financial crisis. The movie is surprisingly great as well. So if you are tired of reading, you can just watch it. When Genius Failed Good story about the spectacular failure of the Long Term Capital Management hedge fund. Red Notice Hedge fund manager turns into social justice warrior after the Russian state murders his lawyer. Book reads reads like thriller, something you don’t expect in the finance category. @Billbrowder is worth a follow on Twitter too. All of the links in this post contain my Amazon affiliate code. If you buy something I will get a small percentage while you get the same price as always. Hopefully this post can make me rich! This entry was posted in General on January 15, 2019 by Alpha Vulture. Trading and Exchanges. A little dated, but great book if you want to learn about market microstucture. The Rediscovered Benjamin Graham by Janet Lowe is my favourite value investing book. I’ve never been able to get all the way through the books he wrote but this collection of his essays and speeches says it all more concisely and it gives you something the other books don’t (unless I suppose you read all the editions) – a sense of how his strategies changed. Hmm yeah, I sort of feel like I have read enough that I’m not so interested in reading more from Benjamin Graham. But maybe it’s a better pick than the Intelligent Investor (and Security Analysis). And it’s my understanding that Graham started to lean more towards efficient markets/indexing later in his life, right? Strategies to beat the market – simple quant strategy of buying low pe stocks with strong balance sheets. Buying closed end funds at a discount to NAV. NCAV bargains when they come up. Criticism of security analysts, portfolio managers: Basically went to an investment conference and said ‘put up or shut up’ to all the fancy talking investment pros. Commodity reserve currency: I didn’t spend a lot of time on this. I’m sure some find it interesting though. Transcripts of lectures at Columbia: One student kept asking a lot of questions about insurance, pretty sure it was Buffett. Testimony at a congressional hearing where he tried to explain the hedge fund business to a bunch of politicians. Sometimes he got kind of testy with them, which was entertaining. If you’ve read his other stuff it’s more or less the same thing. It’s not like he became a momentum guy or something. I wouldn’t say it’s accurate to say he became an EMH proponent though. I think at one point some people were quoting a statement of his from this book out of context to make that argument, but if you read the context you’ll see it was the exact opposite. I’d recommend the book if you can get it for a decent price. Try Zen and the art of motorcycle maintenance, particularly when you are tempted to Iowa’s standards. Never read it, but not the first time I have seen people recommend it. So I guess it’s a good suggestion! Worst book ever. Bunch of spiritual nonsense. One of my two one-star reviews on goodreads. Avoid like the plague. Yeah, that’s a good read as well! Could have added that one easily to the “case studies/entertainment” list. Have to admit I’ve read just one or two from this list as well. Can’t believe you missed Peter Lynch’s One Up On Wallstreet. It is as basic as it gets. I’m currently reading Einhorn’s book and find it very insightful so far. I had to move away from investing books as like you mentioned, way to repetitive. Ended up moving towards learning more about sectors. Thanks for the suggestions. The shipping man is the only one I know from the list, and it was pretty good I think :). Perhaps I’ll have to add some of these other titles to my todo list as well. Thank you. Who is the author of Oil and Gas 101? Trying to find the book. Thanks, I though you were refering to Morgan Downey’s book. But I was confused because it does not say Gas in the title. Great book indeed to learn about the Oil & Gas industry.